One of the things that people miss most on a low carb diet are candy bars and sweet snacks. However, there is no need to completely exclude these from your diet, Linda’s Diet Delites has a great selection of low carb bars and low carb snacks to keep your sweet tooth happy without de-railing your low carb diet. Sometimes we get a bit peckish and need something quick and handy to tide us over until the next meal. It’s all too easy to get tempted by a candy bar or packet of potato chips, but with a bit of forward planning you can stock your cupboards (and your purse) with healthy, nutricious, and more importantly, low carb bars that will fill that hunger hole but still leave you feeling saintly afterwards. 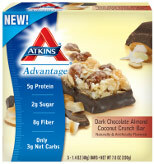 Atkins Advantage Bars are low carb (just 10g net carbs per bar), low in sugar and yet high in protein. The bars are 1.6 ounces so enough to satisfy your appetite and they come in 14 different flavors for you to choose from, so you will be spoilt for choice. These low carb bars are also on special offer at the moment with a 17% discount, retailing at $7.49 for a box of 5. 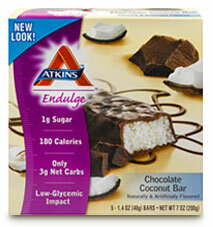 We also sell Atkins Endulge bars, these are a luxurious low carb alternative to regular candy bars. There are 6 flavors to choose from and each low carb bar has no more than 3g net carbs. Again, we currently have these on special offer with a 28% discount and they retail at $6.49 for a box of 5. 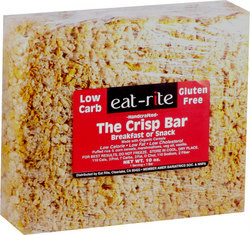 Eat Rite Crisps Bars are made from rice and marshmallows, and flavored with vanilla. A delicious snack that with only 2 diet counts and 5g net carbs can easily be incorporated into your low carb diet. A pack of 7 bars costs $9.99. They are also gluten free. Doctor’s Carbrite Diet Bars not only contain just 2.5g of net carbs they are also free from artificial sweetners such as aspartame and sucralose. They contain no hydrogenated fats or trans-fats making them a truely exceptionally healthy choice of low carb bar. They come in ten great flavors and are just $1.95 a bar. Dixie Diner Sticky Bars are vegetarian, gluten free and completely natural with no added sugars. These low carb bars have just 2-3g of net carbs depending on flavor and there are 3 flavors to choose from. Each bar cost $2.25. We recently added La Nouba Silhouette Bars. These low calorie, sugar free bars, low carb bars are 1 point each.